We last caught up with Malvern-based Tissue Manufacturer ESP 18 months ago, just after they had undergone their initial ISO 9001 & 14001 implementation. Now, hear from Project Manager Isla Buchanan about their standards as they have matured and how the organisation has continued to develop. Essential Supply Products (ESP) is a company that is built upon high standards, both in terms of the products that it produces as well as its level of customer service. With these values at its core, in the 24 years since its formation, ESP has become one of the leading independent manufacturers, converters and wholesale distributors of disposable tissue products in the UK. Even though they had already experienced high levels of growth and success, ESP are a very ambitious company and therefore saw ISO Certification as being able to take them to another level. Although appreciating its importance, ESP held some concerns regarding the implementation process as well as the level of bureaucracy that it may create and so conducted extensive research into the process and potential implementation companies. Once this was completed, they felt very confident in choosing ISO Quality Services Ltd.
“We did meet with other providers however we chose ISO Quality Services due to the fact they were a like-minded company with great personalities that we felt we could work with successfully”. As previously mentioned, there were a few reservations as to how the implementation process would work but after the initial meetings had taken place, ESP commented that these initial concerns had been resolved and that they were very eager to implement both the ISO 9001 Quality Management System and the ISO 14001 Environmental Management System. The main reason for doing so was to create a framework to formalise processes and create a platform for their growth aspirations. The overall aim of the ISO 9001 Quality Management System is to exercise control through conformity of process to achieve customer satisfaction: beneficial both to businesses who have experienced high levels of growth and those who want to take their business to the next level. In addition, the ISO 14001 Environmental Management System not only reassures potential and existing customers that ESP are fully aware of their corporate social responsibility but at the same time it can cut costs dramatically through becoming more energy efficient and reducing waste. This, in turn, will aid ESP’s drive to pursue continual growth. 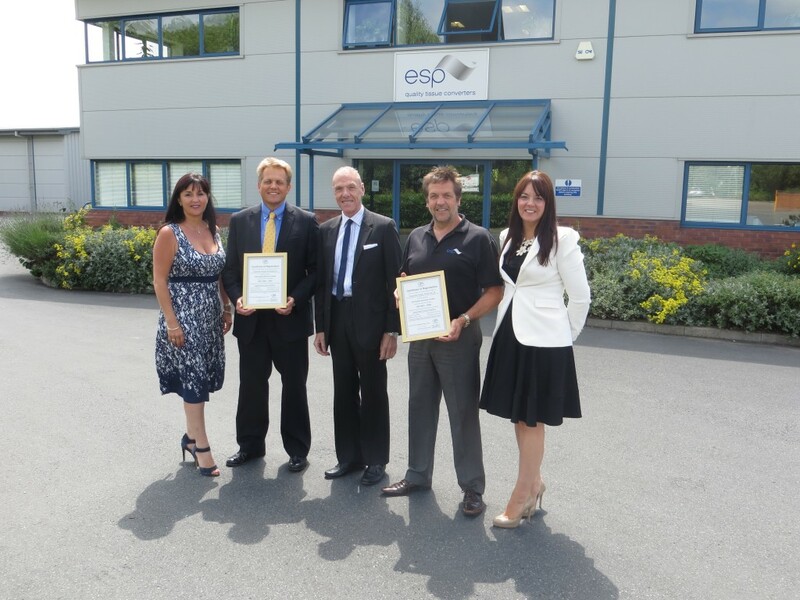 Upon implementation, ESP was delighted with the benefits of becoming ISO certificated. Primarily they highlighted that it verified perception of their competence, both internally and externally. Becoming certificated has enabled them to illustrate to potential and existing clients that they have reached the next level of professionalism. Furthermore, it has meant that they have been able to unlock potential areas of new business which were previously unattainable without ISO certification. “ISO Quality Services provided a great sounding board for advice, help and assistance throughout the implementation process: we would definitely recommend them.”. For more information on ESP, please contact them on 01684 893 797, email or visit their website. Senior Lead Assessor Peter O’Neill (centre), presenting (from left to right) Isla Buchanan, Steve Briggs, Martin Kent and Amanda Waterman of Essential Supply Products Ltd with their ISO 9001 and ISO 14001 Certificates.